What happens after Elizabeth and Darcy tie the knot at the end of Jane Austen’s classic novel Pride and Prejudice? Crime-writing legend P.D. James has the answer in “Death Comes to Pemberley,” which will air on Masterpiece Mystery! in a new two-part adaptation starring Anna Maxwell Martin (Bleak House), Matthew Rhys (The Americans), Matthew Goode (The Good Wife) and Jenna Coleman (Doctor Who). 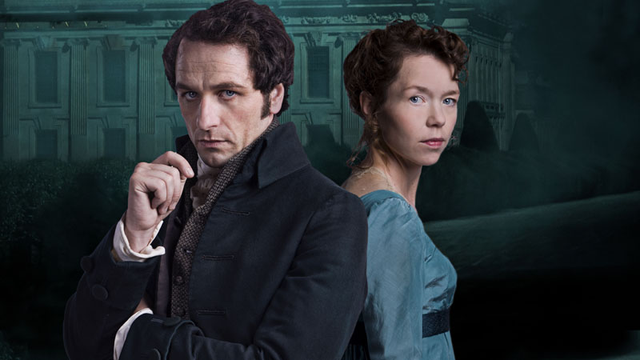 “Death Comes to Pemberley” airs Sundays October 26 and November 2 at 9pm on CET and ThinkTV16. This new program opens six years after Elizabeth accepts Darcy’s marriage proposal with an impending ball at Pemberley, the palatial estate Elizabeth and Darcy share with their young son, Fitzwilliam. Many friends and relatives are invited, but Wickham and Lydia are not because of Wickham’s past conduct with ladies. Of course that doesn’t stop them attempting to crash the party – at least until Wickham and his fellow officer go missing.